I was scrolling through Twitter recently and one of the folks that I follow mentioned “Strawberry Vodka.” Normally fruit-flavored vodka wouldn’t interest me, I was happy to hear about a simple recipe and technique from Sean Timberlake of Punk Domestics, and since it was strawberry season and my market was bursting with fresh berries, I decided to give it a go. Vodka infusions were my gateway drug to DIY (Do-It-Yourself) food. 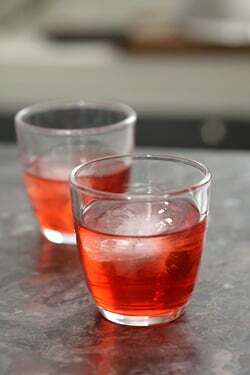 And once I had been bitten by the cooking bug, I discovered ways of imparting flavors into bland, neutral vodka to produce something utterly new. The technique is almost the opposite of cooking: When you cook, the magic ingredient is heat. With infusions and liqueurs, the magic ingredient is time. In many ways, it’s my favorite form of preserving. By extracting the flavor of fruit or other ingredients at the peak of their ripeness, you are capturing their very essence. Lightning in a bottle. 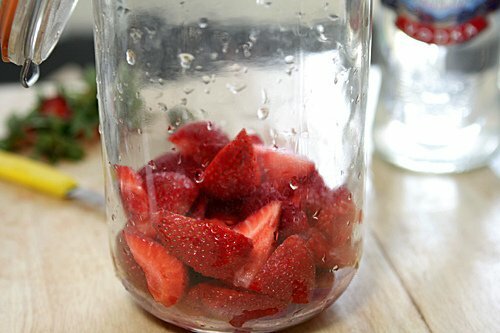 The basics of vodka infusion couldn’t be simpler: Cut up fruit, steep in vodka, strain, drink. The nuance, and the art, is in deciding how much fruit, and how long to steep. When you’ve got gorgeous, ripe, unbelievably fragrant strawberries, it doesn’t take much. A couple of cartons of berries and a few days, max. Always use perfectly ripe, clean and organic fruit. Remember: Vodka is a solvent, so while you’re extracting color, flavor, sweetness and aroma, you could also be extracting pesticides and other chemicals. Choose your fruit wisely. We’re lucky to have some of the best strawberries available anywhere, right here in San Francisco. 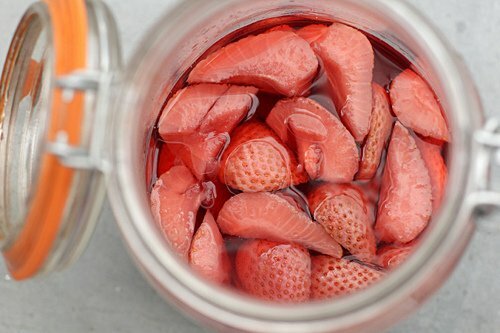 For a recent class on infusions, I used lurid, almost glowingly red Albion strawberries that smelled faintly of bubble gum. When we strained the vodka and tasted it, one of the students said she thought it was better than eating actual strawberries. The flavor of infusions fades relatively quickly – unlike liqueurs – which improve with age. Store in the fridge for several weeks. Or, better yet, keep in the freezer for maximum enjoyment. 1. 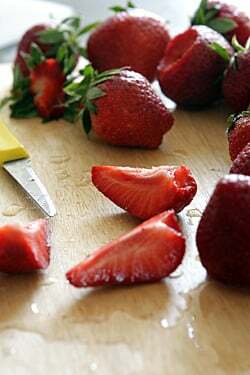 Rinse, hull, and quarter the strawberries and place them in a glass container with lid. Add vodka, cover, and agitate the jar. 2. 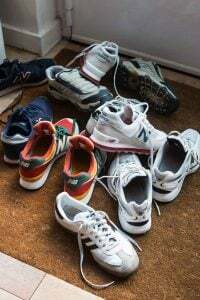 Store in cool, dark place (such as a kitchen cabinet) for 3 to 7 days, swirl around once a day. 3. After 3 to 7 days, strain with cheese cloth. If you want it really clear, strain again through a coffee filter. 4. Store in a bottle – such as the original vodka bottle – and use at your discretion. Visit Sean Timberlake at his site Punk Domestics, a community-driven space dedicated to preserving and conserving, and follow the fun on Twitter and Facebook. We do something similar with pineapple every summer. It is fabulous. I make Black & Blue Vodka most summers: wild blackberries & blueberries, popped straight into the vodka bottle. It becomes the most gorgeous purple color (and doesn’t taste half bad either!). I love Punk Domestics; such a wealth of great preserving and DIY recipes. I’m always finding something new to try. 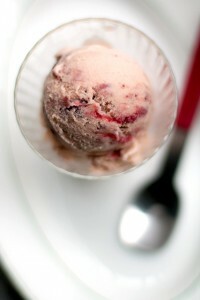 It seems the next obvious step would be Strawberry Vodka ice cream or granite no? There’s absolutely no way in the world this could be bad…methinks I’ll be creating all sorts of fruit vodkas following this method all summer long! What a beautiful summer vodka cocktail. I plain to try it with a bit of diet 7-up! I love vodka infusions – my favourites are the chilli vodka that a friend makes and the lemongrass vodka that the Mandarin Oriental hotel in Singapore serves. Incidentally, their bar also makes a durian infused vodka – and it actually tastes quite OK! Hit submit too soon on the previous comment – the best part about this recipe is that I don’t have to use expensive vodka. Something tells me I’m going to love the strawberry infused vodka. I am off to the store for vodka and the market for strawberries. Next best thing to a cosmo! 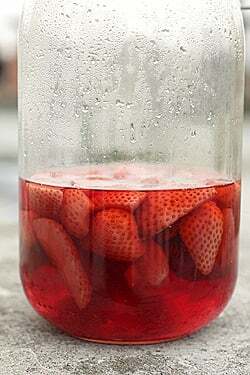 Here’s another great summer fruit infusion, taught to me by a neighbor. 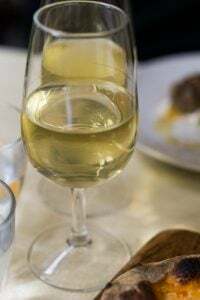 Start with a huge glass vessel (what you might use to store wine or olive oil, but wide-mouthed). As each fruit ripens throughout the spring and summer, place a layer of the fruit in the vessel. Cover with rum (or vodka) and sprinkle with sugar. As the next fruit ripens repeat the process. At summer’s end you have a gorgeous vessel filled with layers of alcohol infused fruit. Use the fruit throughout the fall and winter in desserts, on ice cream or panna cotta. And drink the alcohol…of course! Off to get some fresh berries shortly so it is ready for next weekend! I love simple and tasty. I will definitely do this recipe some justice. I’ll bet blueberry would be beautiful. 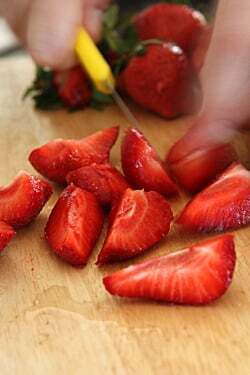 Have you tried eating the strawberries after they have been steeped? I noticed that they are white and lose their color. I could imagine that such vodka-infused strawberry could open doors to creative dishes as well as enjoyment in and of itself. My mind is racing thinking of all the different flavors I can try. How delicious this sounds! If you see a short woman wobbling down the street with a big smile on her face and huge red lips – that’s me. Looks delicious! I can’t wait to try to out. 3-7 days seems like a wide range- any advice on how to decide how many days to let it seep? Also, my house this time of year is generally pretty warm (75-77 F). Is this considered cool? Would I be better off keeping the jar in the fridge? Interesting, as today my visiting family drank my entire supply of peach, 3-berry and lemon vodka. It’s going to be my feature for Pop’s 80th next month. If I can keep my family away from it til then….thanks for the nice post. Oh, this sounds so yummy… I might add that cheap vodka can be made to taste more smooth by running it several times through a counter-top/pitcher-style water filter (like a Britta). I’ve done it with vodka for my limoncello and it really does make a difference. Just make sure to LABEL the pitcher so someone doesn’t assume it’s water and take a chug (learned the hard way!). 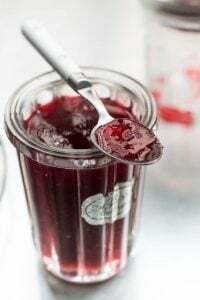 Grace: I let mine steep about 4 days; you can just open the jar and give it a good sniff – I think depending on the strawberries you use (I bought good ones), that might have something to do with the time you want to steep them. 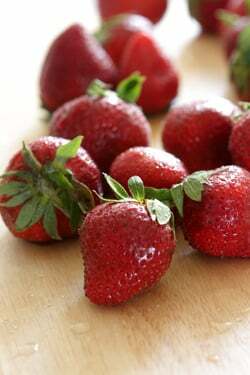 Earl: As mentioned, the strawberries really don’t have any flavor left after the lengthy steeping and although I dislike throwing food away, all of the flavor has been pulled out of them during the infusing. Robin: Have you tried that with inexpensive vodka? I know people used to say that but there’s a lot of contention around that it doesn’t really work. I think once you’re infusing something in vodka, the quality doesn’t matter so much. And those Brita filters are kind of expensive. parisbreakfast: My inclination would be to serve vanilla ice cream (or something else, like strawberry ice cream) doused with some of this, straight-up. But I could see adding a good shot (or two) to granita! i like the idea of the peppercorns in with the strawberry infusion – or also maybe something hot with like chiles. I’ve heard mixed things about the efficacy of running vodka through the filters. I’ve seen filters specially made for this purpose & there seems to be a lot of debate on whether or not they work. (although I don’t really drink a lot of vodka so I haven’t tried them myself to have any personal experience with it) – but my guess would be they don’t. I’d be curious to do a blind side by side taste test to see though. 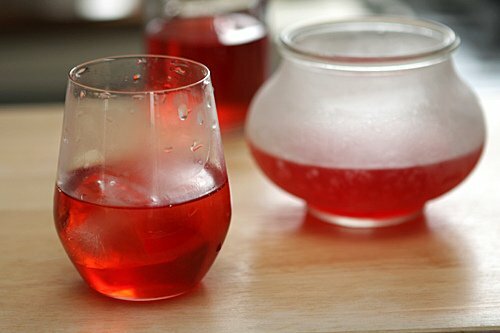 I made some strawberry vodka last year, though when I tasted the rich, syrupy result, I called it strawberry vodka liqueur instead. The main difference from yours is lots of sugar. I gave mine quite a while for the sugar to properly dissolve and for as much flavour to leach out of the strawberries as possible. This sounds lovely and fresh. I usually make fruit and berry liqueurs the traditional way with long steepings so will definitely try this summer version – with them all! As far as I know about vodka etc infused drinks, adding sugar duing the process inhibits the drawing out of flavour. You can add sugar (or sugar syrup) afterwards to taste, waiting a day or so to taste again as the sugar needs to dissolve and the flavour will change. Leaving strawberries to steep for a long time (>2 months) allows the woody flavours from the seeds begin to affect the flavour – not good! My mother (aged 83!) makes sloe gin, raspberry vodka and blackberry brandy (which gave me the first hangover I’ve ever had!) and another friend makes sloe gin and damson gin. My brother can’t drink any of them, as it gives him a headache, isn’t that lucky, all the more for me!!! Love these drinks! I think my mother uses sugar, too, as they appear to keep forever, and, indeed, to get better with time (although the blackberry brandy reacted with the plastic bottle she’d stored it in, and gelled! She swore it was normal, but the stuff she’d given me, in a glass bottle, was and remains liquid and delicious). One year she decided not to discard the raspberries, but left them in the vodka, and they were simply heaven spooned over good-quality vanilla or raspberry ice-cream. I must be telepathetic…ha ha…was literally just thinking about this yesterday as I was making strawberry tarts. Sounds so delicious – I’ll be making it asap. Thanks!! Critical is the quality/flavor of the vodka. You want to make sure you don’t get the harsh aftertaste some brands have–that can be drawn out by the sweetness of the berries, not in a nice way. I love infusing vodka! In fact, I just posted about my latest sugar cane and ginger infused vodka. 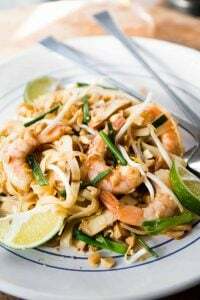 It has a delicious, subtle, sweet and spicy taste. Delish! Try doing the same thing with tequila. Really comes out well. Great in cocktails. I just happen to have an unused litre of good vodka in the fridge, and about a pint of VERY ripe leftover strawberries. . . I love it when a plan comes together! hi matt: I used pretty inexpensive vodka and didn’t notice any bad aftertaste but perhaps my cheap brand is better than some of the others. I used a brand called Poliakov, but it would be interesting to do a side-by-side and check out the difference. I also like trying it with tequila like @Mike suggested, too! Delicious! When I lived in Sicily, I learned how to make limoncello. I love the idea of using berries! Love it! 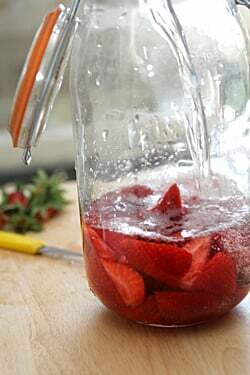 I just started my second batch of limoncello, but now it looks like I’ll have to start making this strawberry vodka, too. Reading this, I’d be interested in making a ginger and apricot version later in the season. Thank you for sharing Sean and David! Good God! Brilliant and simple. I’m making this next weekend to serve on the 14th of July! Sounds like you just need the bottle and a long straw. 4th of July is a good time to try this lovely drink. This is the second hit from your book with many more to follow! Merci. 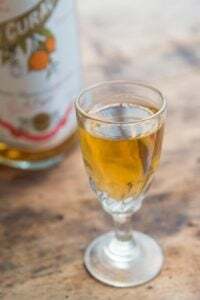 Back in the 1970’s my parents had a Rumtopf: a ceramic pot which was layered with excess fruit in season with each layer covered with alcolhol (rum was usual but you can use other spirits) and left to steep. A bit like the prunes soaked in brandy that I have seen in France too. The contents of the Rumtopf made a delicious mixed fruit alcoholic drink and an interestingly potent fruit mix to serve with ice cream. I do like this idea of using just one flavour rather than a mixture – and the apricot and ginger version sounds great. I’ve never been a vodka drinker (after one or two unfortunate brushes with it in my youth) but I’m loving the idea of this. 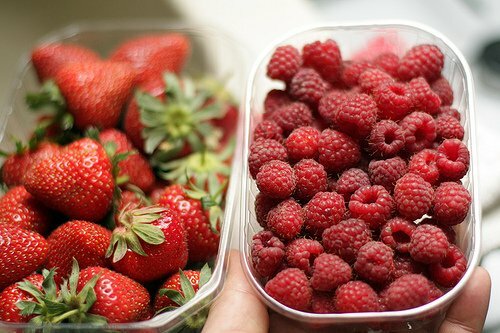 I simply adore raspberries and might give them a try in our summer. I also love the sound of the apricot and ginger version – it would go very nicely with a recipe I have just posted for a sour cream, apricot and ginger cake. 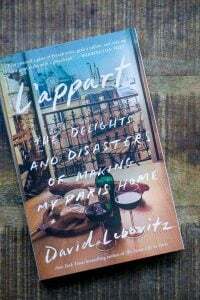 David, not a vodka infusion but a great summer drink–I mixed your Ginger Lemonade syrup from Ripe for Dessert with dark Rum for a variation on a Dark and Stormy. It was really fabulous to sip on a hot summer day. Mix two parts rum with three parts ginger lemonade syrup and serve with a lot of ice. Thanks! My husband Mike’s grandfather made a raspberry vodka years ago with fresh picked berries from their garden in Vermont. Nothing fancy done except to toss the quickly washed berries into the vodka and let them sit…..and sit and sit, probably a lot longer than you suggested. When they finally decided to crack open the bottle of the vodka, the berries and vodka had quite the very pleasant and very strong kick. I have a lot of raspberries and wild blackberries growing and might just try something like this this summer. Oh nice! I read an article recently – can’t remember where – for peach infused vodka. I was tempted and then forgot about it. Your post definitely inspires me to do it now! I read this post yesterday, and rushed to my local farmer’s market to buy strawberries, but alas, our strawberry season is all but finished here in Baltimore County. I did however pick up some beautiful black raspberries with which I am trying this method. We’ll see! David, a question if you please. I was wondering if it would improve the process any to slightly crush the fruit? Is there a reason why you suggest quartering? Thanks, and I loved your pictures! 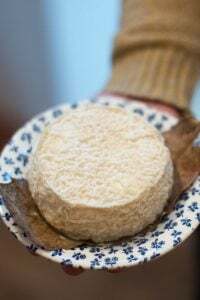 If we don’t have a cheesecloth on hand, is it better to use a run of the mill sieve or a coffee filter? I assume the idea is to get it as purely liquidy as possible, but not sure. I have been using white rum for my infusions (vanilla. black raspberry) because I find the cheaper American vodkas to be rather harsh. Even the cheaper rums available in the USA (Palo Viejo, for instance) are MUCH smoother than comparable vodkas, and no, they don’t infuse a rum flavor. On another note, I have to thank you for giving me a time frame for alcohol infused berries. I just cut up the blackberries, put them in the white rum, with no particular “deadline” in mind. It has been sitting on the shelf for over a month, with the occasional shake. Time to taste, it seems…. That looks so yum! 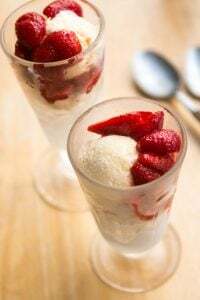 Strawberries are now coming into season here in Australia too, so I might try this recipe. We’re due for a jellyshot party. Am I imagining things? I thought there was a cocktail recipe accompanying this post. The strawberry vodka is strained and ready for a holiday cocktail! Just in case anyone is interested, I used this method with raspberries (red and black) since our local strawberry season is over. It was… not so good. The common consensus was that is tasted like cough syrup. I’d stick to strawberries if you can. 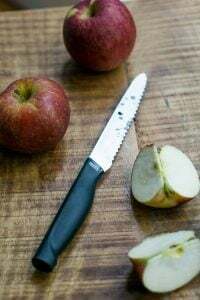 I made something like this, with a higher proportion of fruit to alcohol, a few years back, and found it a good way to prolong really ripe fruit. I have a dilemma this year, the wild raspberries are prolific and I think I will get shot if I put any more than the existing 12 gallon bags in our freezer. I’ve frozen them as whole berries but now I’m wondering if I should can/ puree a dozen quarts. For smoothies, sorbet, and on top of yogurt, I probably wouldn’t mind the puree. But I picked them, by hand, and have the scratches and sun burns and puree makes me sad. How long could I put them in vodka to preserve? Made it with the beautiful organic strawberries from the farm near me. So delicious! Of course it’s great straight-up, but I also tried adding a splash of St. Germain elderflower liqueur — magnifique! I made this last week with some beautiful strawberries from the local farm. The flavor is delicious as is, very cold from the freezer. But it is also delicious mixed with lemonade. Very summery. But we are mourning the all-too-short strawberry season. Hi David! I just made this and it tastes so fantastic, thanks very much for sharing this…. But: mine froze in the freezer :( Is it possible that the strawberries were too juicy and the water made the vodka too weak? What could I do next time to prevent this from happening? Hi – Was coming here to ask about the very same thing Gabrielle asks above. My strawberry vodka froze in the freezer and gets very very thick in the refrigerator. Why? Gabrielle and Tina — that’s certainly unusual, but I suppose it’s possible your berries gave off enough liquid to bring the freezing temp up; it also depends on how cold your freezer is. This happens to me when I do cucumber vodka, since cukes do have quite a lot of water in them. You should find, though, that just taking the bottle out of the freezer for just a minute or two will render it drinkable.